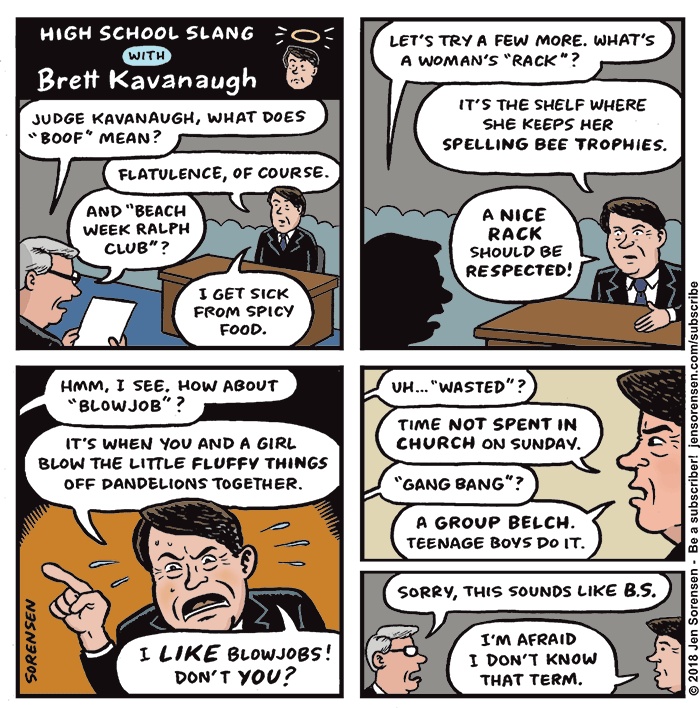 Cartoonist Jen Sorensen expands on SCOTUS nominee Brett Kavanaugh’s disingenuous explanations of his high school yearbook comments. B.S.? 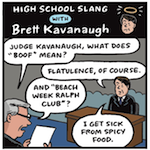 Doesn’t he know that stands for Buffalo Springfield? Paranoia strikes deep. The Supreme Court is the Ninth House of Sagittarius, ruled by Jupiter- now in Scorpio. In the Ninth House B.S. stands for Belief Systems. Add the rulers of Scorpio are Mars in Aquarius and Pluto in Capricorn; Saturn in Capricorn (supreme ruler of Mars and Pluto), is making Neptune’s Pisces a dream reality for the patriarchy (in their abuse of power?). Makes sense to me, Glen… at least, it makes more sense than what we see going on if we don’t factor in astrology.